Being a fan of trading card games and a fan of My Little Pony: Friendship Is Magic, I've been picking up boosters and theme decks for Enterplay's card game since it launched last year. Today I finally played my first game, and it was magical. After months and months of staring at cards with absolutely no idea what any of the numbers meant, I finally gaze upon these colorful pieces of paper with an inkling of understanding, thanks to Enterplay's Steven Bertsch, my guide for the regular "How to Play" sessions happening in the Crystal Ballroom on the third level of the Baltimore Convention Center during this weekend's BronyCon 2014. This is where the card players gather for tournaments at every level of play, from sealed deck tournaments for beginners to high-level play between players who've named their decks and sleep with them under their pillows. It's also where curious parties go to get a hands-on tutorial and a free booster pack (first one's free). The fine folks at Enterplay put together a structured tutorial experience for the show in order to walk new players through the basics. Here's how it goes. Each deck is built around a Mane Character, a prominent personality in the world of Friendship is Magic. Like players of Magic: The Gathering swear by a color combination, players of Enterplay's game stand by their Manes. The characters have two sides — a regular side, and a "Boosted" side, which can be unleashed when certain conditions are met during the game. There are two important numbers on a Mane Card. In the top right, there's a Power number which determines how much of which color element the character possesses, and the Home Limit dictates how many friend cards can be on the field when the player's turn ends. More on that in a bit. Accompanying the Mane Character onto the field is a draw deck of at least 45 cards (no more than three of each type). This deck includes friend cards, resources, event cards and something called Troublemakers, which was not covered in the tutorial. Boo. And then there's the Problem deck, containing ten conundrums for each player to solve. That's what the game is all about, after all — solving problems with your friends, just like the show. When the game begins, the board looks like this, unless you don't have a cool play mat, and if not then what's the point? Each player puts a starting problem in the middle of the field. The Mane takes the field. The randomly determined starting player draws six cards. Oh, and both players will need one of these puppies here. This Score Slider card keeps track of points, which is important as the first person to 15 points wins the game. It also controls the amount of action tokens a player may use each turn — the more points a player has, the more actions they can take. In the interest of fairness, both players get to use the action tokens dictated by the player with the highest score. Pretty sure I'm losing you at this point, because this all sounds like the instruction booklet that came with my first theme deck, which even my demo master Steven admits was really confusing. It's basically why I've never played the game until now. Thankfully, there are much more helpful resources online these days. So, we've got two problem cards on the field, one for each player, and in order to solve them the player must match the resource requirements on the side of the card facing them. With this card facing me, I need two purple and two non-purple resources in order to solve this problem. My opponent needs five of any color. Here we have a hand filled with Friend cards, because you need Friends to solve problems in this universe. The numbers on the left side are the cost to play — Blue Moon costs two action tokens to play. In the top right ae the resources each card brings to the table — Blue Moon is worth two purple. Using my two action tokens for the turn,I play Blue Moon against the problem, and I'm halfway to solving it. Out of action tokens, my turn is over. My opponent draws a card, gathers two action points (which can be accumulated if unused), and applies a card to the same problem I am taking on. Then it's back to me. Another two action tokens and a card drawn, I play Emerald Green against the problem, fulfilling the requirements and scoring my first point. Since I'm the first to confront the problem, I score an additional point as well, bringing my total up to two points. That means everybody now gets three action tokens per round. The game is afoot! Were my opponent to leave me alone, my characters would camp on the problem they've solved, generating an additional point for each round they are in place. Instead, my opponent uses those three action tokens to solve the problem as well, leading to a point for him (no bonus), and a face-off between us. In a face-off, both players flip the top card in their draw deck, adding the power value of whichever card pops up to the combined total power of the characters attacking the problem. The person with the highest total scores a point, the problem is retired, and the friend cards are sent to each players home area, where they'll act as resources for the battles to come. This is a confusing mess. Having been through the entire tutorial, I know exactly what's going on here, but if I walked in on this without foreknowledge, I would be completely lost. I mean, obviously this is a face-off between two players, the guy at the back was about to win with a massive draw deck flip, but then the player at the fore played the Derpy card, which cancels out the deck flip and replaces it with the next. Obviously. It's not Hearthstone, but it's pretty damn entertaining once you know what's going on. My plan is to introduce it to my wife when I get home, and when she rejects it outright I'll wait until Enterplay and Hasbro put out a mobile version of the game and play that on my iPad instead. Remember that tutorial link I shared several paragraphs back? 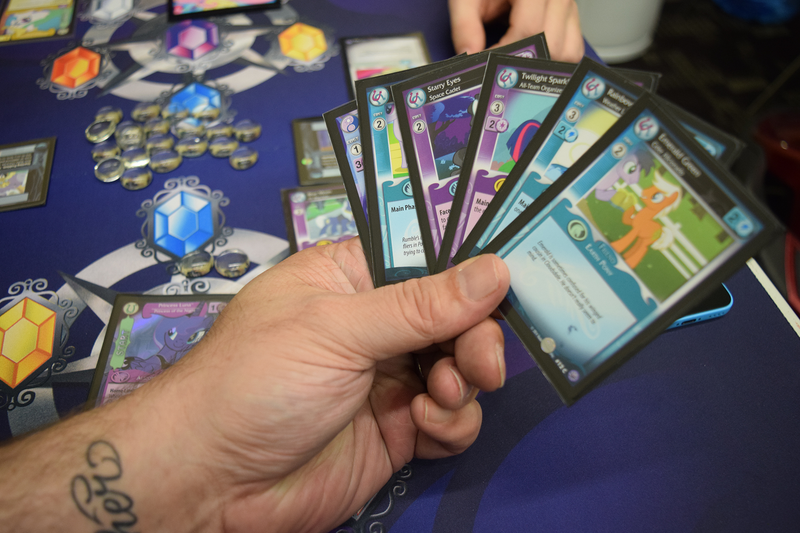 That's how you play the My Little Pony: Friendship Is Magic Collectible Card Game. You are welcome.